FREE Seattle’s Best Deluxe Coffee Sample! 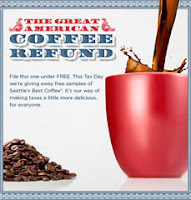 Be one of the first 100,000 to request a free 1.75oz sample of Seattle's Best Coffee! When you get to the page, click the red "Get Refund" image to fill out the form.